1 Ugreen air vent car phone mount holder. 360 degree Rotation & Swivel allows you to adjust perfect angle in 360 degrees. you also can tilt to left, right, up and down to create perfect position unlike other fixed positioned products. UNIVERSAL Car Air Vent Mount Holder. Universal car vent mount fits most smartphones. SAMSUNG Galaxy S3 / S4 / S5 / S5 /EDGE. Designed for one hand operation, to ensure safe driving. SAMSUNG Note 2 / 3 / 4 / Edge. Material: ABS Plastic, Bandage. Type: Finger Holder. 1 x Finger Holder. Features: Anti Slip, Convenient, Finger Mount. Compatible Models: Universal Tablet, Cellphone. 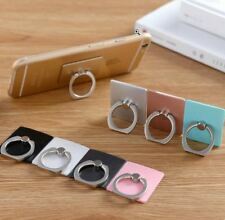 Easy to hold your phone. the picture may not reflect the actual color of the item.